UNISON is inviting all our members from local Branches to come along to the Benefits Fair to see how much money they can save by being a UNISON member, and see what help is on offer to them through our services – welfare, financial and legal. 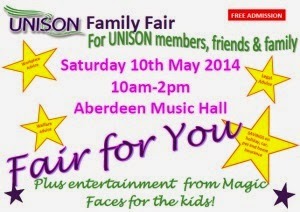 Bring your kids along too, as there will be face painting and balloon modelling from Magic Faces. There are also local charities coming along – so it should be a really good day. Local Organiser, Lyndsey Wallace said, “There are loads of benefits from being in a trade union, from workplace support to health and safety. Trade unions negotiate behind the scenes for members’ pay and terms and conditions and we support a great many individual union members. “However, UNISON offers much more than that and we wanted to give members a chance to find out about the other services we provide which can give them help outside the workplace and save them money. Bring your friends and family along too.